In July of 2014, a little robot began a hitchhiking adventure that would take it across the beautiful Canadian landscape, throughout Germany by February of 2015, and back to Boston in July of the same year. As the little bot started it’s American adventure, the poor thing made it no further than Philadelphia, where vandals destroyed it on August 1st. The little smiling bot enjoyed an entire year being hosted by friendly travelers all across the Canadian and European countrysides. Yet, two weeks in America and the bot got destroyed. So, what does that say about the US? To say that I’m disgusted is an understatement. Here is the latest video showing the culprit who crushed the little bot to bits. Some random hoodlum on the streets of Philly. Am I surprised? Not really. Back in 2014, when our own Justin Pot wrote about hitchBot’s cross-country trek HitchBOT Asked Humans For Help, So They Drove Her Across Canada HitchBOT Asked Humans For Help, So They Drove Her Across Canada HitchBOT – housed in a bucket and equipped with the ability to ask for a ride – hitch-hiked Canada in under a month. Not bad, considering she can't move without humans. Read More , I commented privately to Justin that hitchBot wouldn’t survive very long in the United States. hitchBot was barely in the U.S. for two weeks when he got the PVC kicked out of him. [UPDATE] – Vlogger Jesse Wellens and Bassmaster admitted hoaxing the video above. No one knows who actually destroyed hitchBot, and no one has accepted responsibility even though Wellens was the last person to see or video the robot in one piece. The fate of hitchBot, when viewed in the context of its purpose, reveals a great deal about humanity. When Drs. Frauke Zeller (Ryerson University) and David Harris Smith (McMaster University), decided to build hitchBot, they designed it as a social experiment. This was stated on the very first press release at the hitchBot website. What hitchBot learned about humanity was – at first – enlightening, uplifting, and wonderful. I will review some of what hitchbot learned about society in Canada and Germany. HitchBot’s experience reveals a great deal of good things about those countries. Unfortunately, hitchBot’s experience in the U.S. was quite a bit grimmer. As the years went on and I got older and got my own license, I could never build up the kind of courage my father had to pick up a stranger and give him or her a ride. What it really comes down to is trusting strangers, and at least in my part of America, trusting strangers is something people do much less of these days. Can robots have a little more ? Alas, this was the mission of this little robot as he set out on his journey across Canada. What did hitchBot learn about how much it could trust the people of Canada? How long until it would get stolen and sold off for spare parts? It’s hard enough these days for a person to travel the world relying solely on the kindness of strangers, but a PVC robot with a blinking LED smile? The odds were not good. As hitchBOT made its way on July 27th, 2014 from the Nova Scotia College of Art and Design, headed for Victoria, Dr. Frauke Zeller, one of the cofounders of the social experiment, told the press that hitchBOT’s existence was primarily as a litmus test for the kindness of strangers toward technology. My first thought when I heard about this experiment was a great, resounding “No!” in response to Dr. Zeller’s question. However, Canadians were the first to prove me wrong. It all started when Anne and Brian Saulnier, a couple heading to Kouchibouguac National Park, were thrilled to pull over to pick up the weird-looking gadget. They had heard about the project on the radio, so hitchBOT was lucky enough to start the journey with a pair of fans. But would everyone he met be a fan of technology seeking a ride? Actually, yes. Everyone hitchBOT met in Canada treated the little guy like a celebrity. He was brought to Quebec and then Montreal. One friendly traveler even took hitchBOT on a camping trip to the Blue Heron campground in Charlo, NB. Throughout its travels toward the Pacific Ocean, hitchBOT met one beautiful Canadian after another; all the way making countless friends and revealing to the world just how wonderful and friendly Canadians are, even when offered nothing in return. As hitchBOT’s Canadian adventure approached its end, everyone across social media were speculating about where the little robot should head to next. One prophetic exchange on Instagram expressed the same trepidation about hitchBOT’s fate if its travels took it into the U.S. Although hitchbot did take a little trip down to the Golden Gate Bridge, its next adventure wasn’t an American one, but a German one instead. Like Canadians, Germans proved that what they may lack in humor, they make up for in hospitality. hitchBOT was welcomed with open arms. hitchBOT’s journey across Germany brought this little robot face to face with wonderful people who did not shy away from interacting in a positive way with a technological entity. They didn’t fear it, hate it or envy its gadgetry. They simply gave it it a ride, and maybe snapped a selfie or two with it as well. In the 10 days hitchBOT traveled through Germany, it passed through cities like Munich, Cologne, Berlin and Hamburg. Given, much of its time in Germany was under the care (and some may say the protection) of the German edutainment show Galileo. However, outside of that protection, hitchBOT still safely traveled the German landscape on a bicycle, in a sports car, and even attending a wedding near Frankfurt. The bride even kissed hitchBOT! Nowhere in Germany or the Netherlands did hitchBOT get hit, attacked, ripped off, mugged or even insulted. No, hitchBOT was treated like a guest in a foreign country, and was even welcomed to participate in the carnival Rose Monday Parade in Cologne. 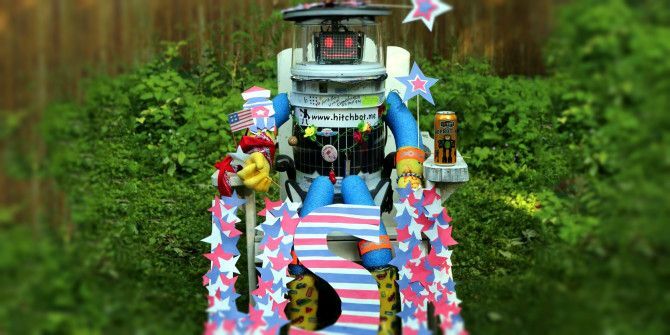 As July of 2015 rolled around and news hit the street that hitchBot had finally landed on the East Coast of the United States, the world turned its gaze toward the United States. Canada, Germany and the Netherlands had answered that grand question, “Can Robots trust humans?” with a resounding yes. Now, Americans needed to step up to the plate and prove to the world that America really is one of the greatest countries on Earth. Week one of hitchBOT’s American journey started in Boston on July 17th. On this same day, the Storify stream was created to chronicle the U.S. adventure. There were a few things in hitchBOT’s favor from the start. Starting out in Boston, there was plenty going for the little robot – getting sent off from the Peabody Essex Museum meant that hitchBOT was likely to get picked up in a “good part of town”, and not likely to run into any problems on its way out of the city. If the trip had started off in Mattapan….fuhgettaboutit. I am actually underplaying the great time hitchBOT had traveling around Boston. Someone actually took the little guy to a Red Sox game (it was on the bucket list). By July 24th, the little techno-traveler had actually made it halfway through Connecticut on its way to New York City. By July 25th, they had hitchBOT sitting at the desk of NBC Studios before getting a full tour of NYC on the 26th! The odds were looking better all the time that hitchBOT may actually survive its U.S. tour. Approaching two weeks, the little PVC gadget had just survived two of the cities most likely to cause it the most grief. Headed toward Philly, it’s cross country tour looked promising. Then disaster struck. Maybe hitchBOT’s mistake was trusting YouTube vlogger Jesse Wellens for a ride into Philadelphia on the morning of August 1st. Dropping the Robot at Elfreths Ally. Waiting for one of you peeps to pick it up. Maybe its mistake was setting course through Philadelphia in the first place – the city of “brotherly love” hasn’t been very loving in recent years. There are roughly 10% more shootings and murders this year than there were in 2015. With gang activity on the rise, the city just doesn’t feel like a very nice place to be. hitchBOT learned this lesson the hard way. While innocently waiting on a streetside bench at Elfreths Ally, an anonymous hoodlum walked by once, poked at hitchBOT a few times, and then stomped it to pieces for absolutely no reason. The fact that hitchBOT could survive for so long in Canada and across Europe, in the company of such wonderful people, says volumes about the type of people who live in those countries and their relationship with technology. Likewise, the fact that hitchBOT couldn’t survive for more than two weeks – and barely two hours on the streets of Philly – says volumes about the type of people who live in America and their relationship with technology. What hitchBOT learned – and what every future robot should be aware of – is that no; robots can’t trust humans on the streets of America. What does that mean for self-driving cars, drones, and the other autonomous robots who will soon be sharing our roads and homes? Nothing good, I’m afraid. Do you think there should be another hitchBOT experiment in the near future? If so, should they keep it out of the United States if possible? Share your own thoughts in the comments section below! Amazon Tests a Delivery Robot Called ScoutCould Black Phosphorous Be the Future of Microchips? This article somehow tries to angle it as if though it was destroyed because Americans are afraid of robots. Do you honestly think whatever deadbeat trashed this "robot" considered the possibility of his future being jeopardized by this device? What future? The man was out in the middle of the night doing god knows what, a future is not something he should be concerned about. This was good old vandalism, could probably have happened in many European cities as well. Try sending him through Luton. I disagree. I think the US will lead the way in adoption of robots. Just that it's not ready *yet*, is what I think Ryan is pointing out. I think you are ascribing too high a motive to the lowlifes that vandalized hitchBot. They did not do it because they are Luddites. I don't think their thought process was as complicated as "we don't like machines, we hate robots". The thought process was as basic as "oooh, a shiny! Wouldn't it be fun (funny) if we broke it?!" These are the kind of morons that play mailbox baseball, vandalize cars, shoot cats and dogs with BB guns, run over people's garbage cans and lawn furniture and beat up hitchhikers just for the fun of it. In a word - knuckle draggers. And, as Howard Blair points out, it could have happened anywhere. Pfah. It could have happened anywhere; it just happened in Philadelphia. It could have gotten hit by a garbage truck. It could have been run over by a drunk driver. It just turns out it was vandalized in the US. This could have happened in any Canadian or European city, it just didn't. "...little bot started it’s American adventure..." *its* - only use "it's" when you mean "it is" or "it has."